The number of out-of-school science programs, which refers to science education at outside school environments, is gradually increasing. Although out-of-school programs are generally considered to be important for the development of pupils’ science knowledge and skills, more evidence concerning the learning effect of these programs is needed. In the present study, we explored whether different degrees of implementation of a connected in-school and out-of-school science program affect pupils’ cognitive science skills in relation to teachers’/instructors’ support. We used a multiple case study design with four cases comprising three different degrees of program implementation: optimal, intermediary and marginal. The cases comprised pupils of upper grade elementary school classes, their teachers, and the instructors of the out-of-school activity. The effect of the program was measured by coding pupils’ performance with a scale based on skill theory, and by coding teacher’s/instructor’s support with the Openness Scale. The data was gathered from microgenetic measurements over time, corresponding with an in-depth analysis of the process of change in naturalistic conditions. We found the highest learning effect in the optimal program implementation, which indicates that it is favorable to implement the complete program, and train teachers/instructors to use open teaching focused on conceptual understanding. Geveke, C. H., et al. "Improving Pupils’ Conceptual Understanding by a Connected In-school and Out-of-school Science Program: A Multiple Case Study." American Journal of Educational Research 4.1 (2016): 115-125. Geveke, C. H. , Steenbeek, H. W. , Doornenbal, J. M. , & Geert, P. C. L. V. (2016). Improving Pupils’ Conceptual Understanding by a Connected In-school and Out-of-school Science Program: A Multiple Case Study. American Journal of Educational Research, 4(1), 115-125. Geveke, C. H., H. W. Steenbeek, J. M. Doornenbal, and P. C. L. van Geert. "Improving Pupils’ Conceptual Understanding by a Connected In-school and Out-of-school Science Program: A Multiple Case Study." American Journal of Educational Research 4, no. 1 (2016): 115-125. In order to gain insight into the development of pupils’ science knowledge and skills, it is important to study the various ways in which pupils develop understanding and the ways teachers and instructors in science programs can support this learning process optimally. There is already considerable evidence suggesting that out-of-school science programs contribute to the science learning process [1-6]. In this study, out-of-school learning refers to “education taking place during school hours and according to the curriculum, but using learning sources and educational environment outside the physical school buildings” . Recommendations for practice derived from research often focus on the three important components of out-of-school programs: a) preparation for a visit out of school; b) the actual visit; c) incorporation of the subject matter in the school curriculum [6, 8, 9, 10, 11, 12]. These components stress the importance of connecting the out-of-school science activity with the school curriculum, creating a connected in-school and out-of-school science program. Despite the growing evidence that out-of-school science programs are beneficial, only scant attention is paid to the cognitive learning effect of these less formal science programs when compared with the learning effect in regular school settings. The current multiple case study aims to contribute to this deficiency by examining teaching and learning science in a connected in-school and out-of-school science program by using a microgenetic method [13, 14]. Several studies have pointed to the importance of connecting the out-of-school activities to the school curriculum (see e.g., [1, 2, 15]). In two meta analyses, Rickinson et al. found evidence that out-of-school programs, if well planned and embedded into the school context, add value for learning. However, research also shows that out-of-school programs are often not adopted properly [8, 10, 16]. Consequently, it seems that the effect of connected in-school and out-of-school science programs is dependent on the implementation. According to Durlak and DuPre , the effect of implementation is dependent on: a) the quality of the program implementation (i.e., how well the program components have been carried out); and b) quantity of program implementation (i.e., dosage of components of the originally intended program that was carried out). In order to determine whether out-of-school science programs offer significant learning effects for pupils, scholars have been investigating the cognitive learning gains of these programs(e.g., [2, 18]). When focusing on the cognitive aspects, three types of knowledge can be taken into account: procedural knowledge, declarative knowledge, and conceptual knowledge or conceptual understanding. In this study, we focus only on the latter two. Declarative knowledge refers to the recall of factual information (e.g., definitions), traditionally defined as knowing ‘that’, or as ‘knowledge about’ . This type of knowledge does not imply deeper scientific reasoning. Declarative knowledge is a less complex form of knowledge , which naturally accumulates as pupils grow older. Declarative knowledge acquisition occurs by assimilating new information to existing schemata. This may take place without making structural modifications to existing schemata or concepts , unlike how conceptual understanding takes place. Conceptual understanding, on the other hand, refers to deep, complex knowledge related to core understanding . Consequently, an increase in conceptual understanding during a connected in-school and out-of-school science program can be considered to be a positive cognitive learning effect of the implementation of the program. To learn more about the characteristics of the process of cognitive development as an effect of a science program implementation, it is necessary to observe the learning process while it occurs , for instance, by using skill theory [24, 25, 26]. According to skill theory, cognitive development (i.e., declarative knowledge and conceptual understanding) proceeds through different stages in a non-linear way. Development is non-linear because it takes the form of a dynamic pathway constructed in real-time and through interaction with the environment. Skill theory does not focus on the level a pupil reaches at a certain stage, but at the level at which a pupil can perform in a particular situation or context with various degrees of support in the here-and-now situation. By means of a scale based on skill theory, development of cognitive skills can be measured by observing the pupil’s performances in concrete teaching-learning activities [27, 28]. As declarative knowledge is lower ordered, its complexity level has a limitation. In contrast, conceptual understanding can be developed at a high complexity level. When pupils try to solve a problem, they work through cycles of less sophisticated and less complex skills up to more complex forms of understanding. The construction of conceptual understanding, which is constructed in the here-and-now, is intertwined with the long-term development. In other words, the changes in the here-and-now directly influence the long-term development, and, vice versa, the long-term development determines the short-term actions [29, 30]. For instance, a teacher assists a pupil in learning about the phases of the moon by shining a flashlight on a ball. This form of help not only influences the short term actions leading to understanding the phases of the moon, but also influences understanding future similar phenomena, such as phases on other planets, shadows, and rotations. On the other hand, the pupil’s previous development in understanding phenomenain space in the long-term timescale affects the performance in the short-term actions: understanding is built upon previous encounters with the phenomenon. This suggests that observations in naturalistic contexts involving potentially rich forms of actual thinking and learning are necessary. All successful science education is based on a mixture of active and inquiry teaching and learning, that is, self-regulated exploration guided by teachers. In their meta-analysis of 164 studies regarding several teaching methods, Alfieri et al. showed that pupils benefit from enhanced discovery more than from direct instruction, such as direct teaching and explaining. The authors appeal for an approach, in which the teacher uses a strategy that focuses on constructing explanations in guided discovery, such as giving feedback, exposing pupils to worked-examples, scaffolding the learning process, and eliciting explanations from pupils. Unfortunately, in traditional science education, the dominant format is that of transferring declarative knowledge, and evoking declarative knowledge from pupils [19, 32]. Teachers frequently ask pupils for answers about declarative knowledge that the pupils already have . In doing so, they are essentially trying to hold on to their prepared lessons , and thereby neglect the complex process of adapting to the pupil’s changing conceptual understanding. In general, scholars agree that the best way of stimulating conceptual understanding is by using an open teaching style focused on conceptual understanding: i.e., eliciting explanations and predictions from pupils by asking thought provoking questions [33, 35]. By asking questions and encouraging pupils to speak, the teacher can probe pupils’ reasoning, helping pupils to explain their thoughts, and consider different points of view. Another aspect of open teaching is providing enough think-time in order to increase pupils’ conceptual understanding [36, 37, 38, 39]. An open teaching style, which focuses on conceptual understanding, using high quality questioning is not easy to apply, as it is a complex practice . However, Wetzels  has shown that trained teachers can develop open teaching skills, resulting in more optimal support in understanding scientific concepts. Consequently, in science programs − both in and out-of-school − the quality of teaching is essential, and can be developed. In science lessons where conceptual understanding is promoted, the teacher and pupils both contribute to the reasoning process that is taking place in real-time. Both teacher and pupils add new information to existing concepts. This socially embedded process of adaptation of the teacher, or a more experienced peer, to a particular pupil’s thinking is both challenging and transforming to the pupil’s old concepts . Teachers - as being more expert learners - have an important role in supporting (or scaffolding) the learning process of the less advanced learners, not by transferring knowledge, but by co-constructing knowledge together with the pupils . Through support, the teacher brings conceptual understanding to a much higher level than is expected when no guidance is given [26, 28]. This mutually stimulating process is constructed in real-time , and should be measured accordingly; that is, it should be measured on the basis of real-time observations in naturalistic settings, in which conceptual understanding is constructed by pupils and teachers. The aim of this study is to observe the learning effect on pupils of a connected in-school and out-of-school science program in relation to the support the teacher or instructor gives during the program, using different forms of program implementations. We wanted to know how different forms of implementation of a connected in-school and out-of-school science program affect pupils’ cognitive science skills (conceptual understanding and declarative knowledge) in relation to teachers’/instructors’ support. The cases comprise pupils from upper primary classes in a science program, which took place both in school with their teachers, as well as out of school with an instructor. The implementation of the program differs per case, that is, the implementation differs in quality of the teachers and instructors (trained/untrained in using an open teaching style focused on conceptual understanding), and in the amount of lessons with trained teachers/instructors (complete or incomplete program). Firstly, we wanted to explore the co-construction of understanding scientific phenomena, that is, the relation between the support of the teacher/instructor and the performances of the pupils. We focused on conceptual understanding because of its potential to reach high level of complexity. Our first hypothesis states the following: Pupils’ conceptual understanding and teacher’s/instructor’s support in eliciting conceptual understanding are related, implying contingency, in real-time. Learning science is a form of co-construction by pupils and teacher. We expected that teacher and pupils would mutually stimulate each other in performance and support. We expected to see this coupling effect both within the lessons and over a longer period of time. Secondly, we wanted to find out if training in open teaching facilitates teachers/instructors in applying support focused on eliciting conceptual understanding. Hypothesis 2ais as follows: Trained teachers/instructors apply an open teaching style focused on the support more often than untrained teachers/instructors. We expected that even a single training would show differences (cf. ) in the application of an open teaching style. Additionally, we were curious if the training indirectly affects pupils’ performances, presumed that teachers’/instructors’ support and pupils’ performances are related (first hypothesis). Hypothesis 2b states the following: Pupils show a higher amount of conceptual understanding in the presence of a trained teacher or instructor. Thirdly, we wanted to know the significance of how the program was implemented. Our third hypothesis is the following: The learning effect in terms of pupils’ performances is related to the program implementation. The program implementation is determined by the extent of the program, that is, the amount of components (i.e., ‘preparation’, ‘visit out of school,’ and ‘incorporation in the school curriculum’) and whether the components involved trained or untrained teachers/instructors. 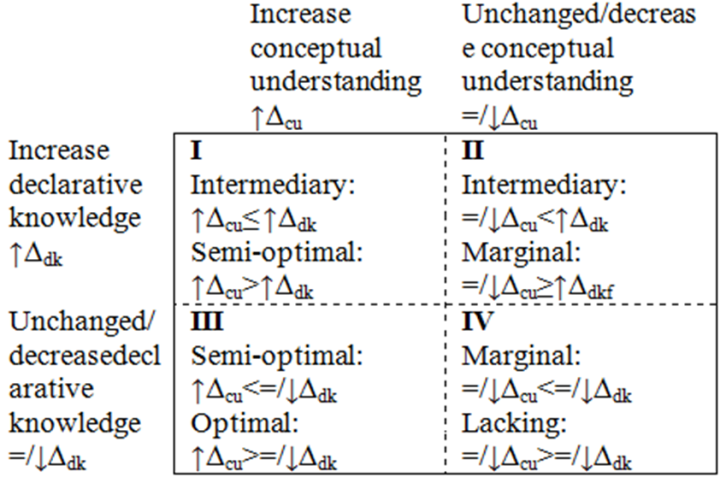 The learning effect of the implementation is defined by the change in frequency of instances of conceptual understanding over time relative to the change in declarative knowledge. In this case study, four upper grade classes of two elementary schools participated in a connected in-school and out-of-school science program during the preparation period, the visit itself, and the post discussion period. The visit involved an interactive presentation in a Mobile Planetarium, one of the activities that the Science Network in the North of the Netherlands offers. The pupils, all aged 9 to 12, participated in various activities with a teacher inside the classroom, and they participated in out-of-school activities with an instructor inside the Mobile Planetarium. This study was carried out in a naturalistic setting, which means that the cases were real and ecologically valid. This also means that we had limited freedom in selecting the cases, and that we had to accept the cases as they were. We did not interfere with the teachers’/instructors’ behavior or planning, meaning they had the freedom to deviate from the program to fit their personal preferences. To understand the micro-development of teaching and learning in this connected in-school and out-of-school science program, we used the microgenetic method [13, 14]. Because this study focuses on various forms of program implementations, naturalistic settings, and in-depth analysis of real-time processes, a design with multiple cases was used. The cases differed in forms of program implementations: optimal implementation (OI), intermediary implementation (II) and marginal implementation (MI). The quality of the program implementation was determined by the pupils’ exposure to trained teachers/instructors, and the quantity of the program implementation was determined by the extent of the program (Table 1). The training for the instructors consisted of a brief workshop in open teaching, focused on eliciting conceptual understanding. (See 2.2). The completeness of the program refers to the three important components for implementation in connected in-school and out-of-school science program: ‘preparation’, ‘visit out of school’ and ‘incorporation in the school curriculum’ [6, 8, 9, 10, 11, 12]. (See 2.2.). The participants involved in the case study were from two elementary schools in the north of the Netherlands. From each selected school, two upper grade classes were involved. The pupils' class teachers were included in this study, except for in the case of one class (case 1). Because this one class needed to follow the optimal implementation variant, the class teacher needed to be trained. As the teacher did not participate in a training in open teaching, we needed to assign trained class teachers from the Science Network to this case. For organizational reasons we had to assign two teachers, one for the preparation lesson and the immediate follow-up lesson, and one other teacher for the summary follow-up lesson. These teachers were experts in open teaching focused on eliciting conceptual understanding, as they trained the instructors, analyzed the data of various instructors, and developed the lesson manuals. Not only the trained teachers, but also the instructors of the out-of-school activity connected to the Science Network were included in this study. An overview of other relevant case characteristics can be found in Table 2. The cases were comparable in most characteristics, except that case 1 (OI) was the youngest age group, contained various levels of performances, and was from the lower performing school. This unique situation suggests that if these distal factors had influenced the learning outcomes of the program in terms of performances, and the performances were positive compared with the other cases, we would have a strong case for an optimal program implementation. Before the start of the study, the teachers, the instructors, and the parents of the pupils signed an informed consent form, and pupils of whom the parents did not agree were excluded from the study. The quality of the program implementation was determined by the pupils’ exposure to trained teachers/instructors. Because the Mobile Planetarium is one of the out-of-school activities connected to the Science Network in the North of the Netherlands, it was compulsory for all instructors to participate in a workshop on open teaching and eliciting conceptual understanding (a short variant of the Curious Minds training ), as this is part of the network’s policy. The instructors participating in the workshop saw worked-examples, and were trained in applying an open teaching style, focused on eliciting scientific reasoning in general and conceptual understanding specifically. The instructors of the Mobile Planetarium were confronted with results from a previous pilot (video observations). The instructors assigned to the cases 1 (OI), 2 (II) and 3 (II) were trained before the data collection, and the instructor assigned to case 4 (MI) was trained after the data collection. The quantitative aspect of the program implementation was determined by the extent of the program. In line with the three important components: ‘preparation’, ‘visit out of school’ and ‘incorporation in the school curriculum’ [6, 8, 9, 10, 11, 12], the complete program comprised three stages: preparation period, the visit to the Mobile Planetarium itself, and the post discussion period. In the preparation period, a lesson about phases of the moon was given by the classroom teacher, and on the day of the visit, a demonstration of a tellurium, which is a model to explain the orbit of the earth and the moon, was provided by the instructor. During the visit to the Mobile Planetarium, the pupils participated in an interactive presentation about the phases of the moon, planets in our solar system, constellations, and galaxies. In the post discussion period, two follow-up lessons were given: an immediate follow-up lesson about constellations and galaxies and a summary follow-up lesson about the previously discussed topics. In contrast with case 1, case 2, and case 3, case 4 did not participate in the complete program. This case lacked the important component of ‘preparation’ by starting directly with the visit to the Mobile Planetarium. The manuals of both the out-of-school activity and the lessons in the classroom were developed in cooperation with the Kapteyn Astro Institute of the University of Groningen and the Science Network in the North of the Netherlands. The teachers received the lesson plans with a manual several weeks before the visit. They were required to follow the manual, but they could somewhat deviate from it to adapt it to their own unique teaching style. Just as the classroom teachers, the instructors of the Mobile Planetarium were also required to follow the manual, but they could also adapt to the real-time conversation. All lessons were videotaped. The teacher’s/instructor’s and pupils’ utterances of the first 800 seconds of each lesson were transcribed in order to code the utterances of pupils and teachers/instructors as precisely as possible. Because we wanted to compare absolute scores, it was necessary to cut the codings off at the minimum lesson time, which we determined to be 800 seconds. By comparing the codings of the 800 seconds of one lesson with the codings of the entire lesson with a duration of 1030 seconds, we found that the percentage of utterances per variable of the first 800 seconds hardly deviated from the entire lesson. This means that the first 800 were representative for the entire lesson. To observe the change in the teaching and learning process, a detailed coding scheme using video coding software, Mediacoder , was applied. To determine eventual changes in the performances of the pupils, which we assumed were related to the support of the teachers/instructors (hypothesis 1) and the program implementation (hypothesis 3), we compared performances during the visit to the Mobile Planetarium (t1) with those in the summary follow-up lesson (t2) five weeks later. Both the visit and the follow-up lesson consisted of a group conversation with no variation in activities, which made the material suitable for comparison. To measure the performance of the pupils, a scale based on skill theory was used . The original scale consists of 10 levels, grouped into 3 tiers, and builds in complexity. The first tier consists of sensorimotor skills- observations based on sensorimotor experiences and action-perception coupling. The second tier consists of representations - concepts that are independent of specific actions, although based upon them, which relate to non-observable entities and observations of non-common objects. The third tier consists of abstractions - general rules or laws. Within each tier, various levels of complexity can be distinguished. The scale is hierarchically structured; within each tier, several steps are scaled from single elements, combined elements, and multi-relational elements. According to Schwartz & Fischer , the transition from understanding at a sensorimotor level to understanding at a representational level is a powerful experience, as it serves as a foundation for more complex representations. Accordingly, the first form of complex understanding starts at the representational level. Therefore, we coded utterances at both a representational level (level 4, 5 and 6) and at an abstraction level (7). 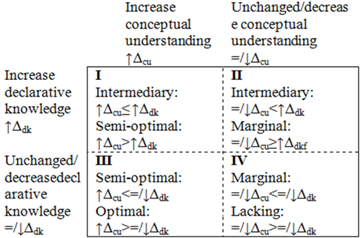 Within the tier of representations, a distinction was made between declarative knowledge and conceptual understanding (Table 3). To measure the support of the teacher/instructor, as expressed in the level of openness in the teaching style, we used the Openness Scale of Meindertsma et al. . This scale has seven levels on which utterances of the teacher/instructors can be scored, starting from a closed style, in which the teacher has a leading role (e.g., providing instruction) in the first three levels, moving to a more open form of teaching, in which the pupils have more opportunity to speak (e.g., providing think-time) in the last four levels. In this study we focused only on the part of the scale that measures openness (i.e., the last four levels), which comprises the following hierarchically scaled levels: asking closed questions, asking open questions, encouraging pupils to speak further, and providing think-time. Whenever openness was coded, we coded for either eliciting declarative knowledge or eliciting conceptual understanding. Table 4 shows an overview of the variables related to teacher/instructor levels of openness with corresponding examples. The utterances of the pupils and the teachers/instructors were coded in real-time fashion (exact time, with a deviation of -1 second or +1 second), using a code book with detailed descriptions and examples for the codings, resulting in two timeseries: one for the pupils and one for the teacher. We used the utterances of all pupils in the class as one variable, as pupils co-construct knowledge, and respond to previous input in the lesson. The coding proceeded in multiple steps. The first step in the coding was to determine the precise moment when utterances of the pupil and the teacher started and ended. The second step was to determine which variable should be coded on the particular time stamp. The third step was to label the variable by the type of knowledge or the type of openness. The inter-observer agreement was assessed by comparing the codes of the first author with those given by an independent trained observer. The reliability of the coding of 50% of the data was satisfying. For the "openness of the teacher”, a proportional agreement rate of 0.86; p< 0.000 was achieved, and for the “type of support,” a rate of 0.79; p<0.000 was achieved. For the “complexity of pupils’ utterances”, a rate of 0.86; p<0.000 was achieved, and for “type of knowledge”, a rate of 0.81 p<0.000 was achieved. To explore if the increase in eliciting conceptual understanding was related to pupils’ conceptual understanding, we first compared the amount of time the teachers used to elicit conceptual understanding in the out-of-school activity (t1) with the amount of time the instructors used in the summary follow-up lesson (t2). We followed the same procedure for the change in pupils’ conceptual understanding. We used the amount of time to compare the data with the time serial data to explore the real-time co-construction. To estimate the probability that a difference between the two measurements was caused by chance alone, a Monte-Carlo analysis  was used. This non-parametric permutation test has good statistical validity in the case of small samples, and is used in combination with Excel and Poptools . The software also helps with the analysis of simulation of stochastic processes. After calculating the differences in conceptual understanding/eliciting conceptual understanding between the out-of-school activities and the summary follow-up lessons, the second step was to shuffle the empirical data randomly per variable over both lessons (out-of-school activity and summary follow-up lesson),and again calculate the differences in conceptual understanding/eliciting conceptual understanding. The shuffling resulted in randomly assigned data to the two lessons. This outcome corresponded with our null hypothesis, which stated that there would be no differences between the two measurements in time. The third step was to test, using the Monte Carlo simulations, whether the differences in conceptual understanding/eliciting conceptual understanding between the out-of-school activity and the follow-up lesson were larger than the differences in the randomly permuted data (expressed in a p-value). We considered a change to be a trend if the predicted direction of the p-value was between 0.10 and 0.05, and a reliable change in use of (eliciting) conceptual understanding if the p-value was under 0.05. This procedure was also applied to determine if the amount of eliciting conceptual understanding differed between untrained teachers and trained teachers (hypothesis 2a), and if the amount of utterances of conceptual understanding of pupils in a class with an untrained teacher differed from the amount of uttered conceptual understanding in a class with a trained teacher (hypothesis 2b). However, in this application, we did not count for the amount of seconds, but instead we counted the frequencies of utterances of conceptual understanding/eliciting conceptual understanding, as we did not need to compare the data with time-serial data to explore co-construction. Because this analysis contained two different categories (trained – untrained teachers/instructors) and not time-series, in which case a trend of development could be detected, a p-value of at least .05 was used to find a reliable difference. To determine the learning effect of the program (third hypothesis), we counted the frequencies of utterances of conceptual understanding, declarative knowledge, eliciting conceptual understanding, and eliciting declarative knowledge. We calculated the differences in absolute scores, and we were interested to find a trend towards a positive learning effect (0.05 >p< 0.10) or a reliable change (p< 0.05). Secondly, to explore the co-construction over time (first hypothesis), we plotted the raw time-serial data of the levels of conceptual understanding and the levels of openness in eliciting conceptual understanding. However, the graphs contained too many data points to find correspondences between the pupils’ conceptual understanding and the level of the teacher’/instructor’ support, and therefore, we used a Loess smoothing of the timeseries . Smoothed data makes it easier to interpret the data when the data points are very dense, as was the case in the present study. The smoothing of the level of pupils’ conceptual understanding and the level of teacher/instructor support on eliciting conceptual understanding in the out-of-school visit and the summary lesson was plotted for each case. Thirdly, in order to determine the learning effect related to the program implementation (third hypothesis), we defined a quadrant of effect of the program (Figure 1). All effects concerned the increase or decrease in frequency of both conceptual understanding and declarative knowledge, relative to each other. 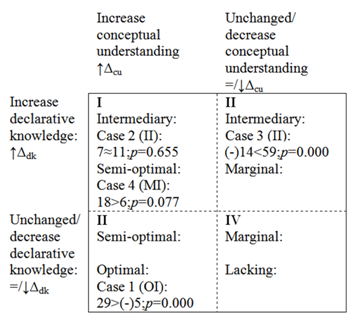 Optimal learning effects of the implementation were defined when an increase in conceptual understanding was found (quadrant I and III, left side of the table), and a lack of effect of the implementation was defined when a decrease in conceptual understanding was found (quadrant II and IV, right side of the table). 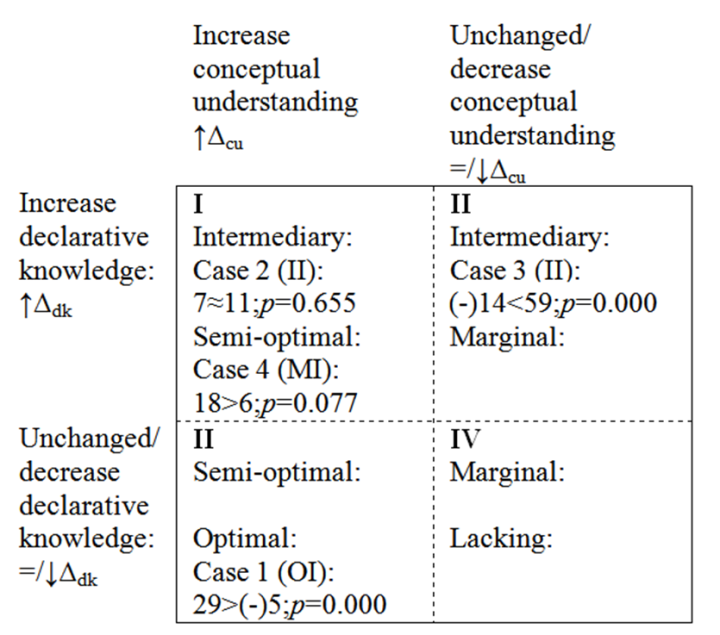 A difference score between absolute change in conceptual understanding and absolute change in declarative knowledge in favor of the increasing conceptual understanding was defined as more optimal (cf. ) than no difference or a larger difference score in favor of declarative knowledge. ∆cu refers to difference between amount of uttered conceptual understanding in the summary follow-up lesson (t2) and the visit in the Mobile Planetarium (t1). Similarly, ∆dk refers to difference between the amount of uttered declarative knowledge in t2 and t1. An increase is marked by ↑ and a decrease by ↓. We hypothesized that pupils’ conceptual understanding and teacher’s/instructors’ support in eliciting conceptual understanding were related. In order to determine how conceptual understanding was related to the support in eliciting conceptual understanding, considering the form of implementation, we compared the change in amount of time (seconds) teachers/instructors offered support in eliciting conceptual understanding with the change in amount of time pupils’ demonstrated conceptual understanding during the visit to the Mobile Planetarium (t1) and in the summary follow-up lesson (t2), five weeks later (see Figure 2). In all cases, a change in time pupils used to utter conceptual understanding corresponded with the change in time the teacher’s/instructor’s used to support pupils in eliciting conceptual understanding. In case 1 (OI) the pupils’ conceptual understanding increased significantly (+67, p=0.000), as did the support in eliciting conceptual understanding (+135, p=0.000). Also, in the cases 2 (II) and 3 (II), pupils’ performances and teacher’s/instructor’s support appears to be related. In case 2, the probability that the expected and observed positive change in the volume of pupils’ conceptual understanding (+16) was due to chance is p=0.103. The negative change in teacher’s/instructor’s support (-2) is very likely due to chance(p=0.436). In case 3 the amount of time pupils demonstrated conceptual understanding clearly declined (-36), (p=0.003), as well as the time the teacher spent on support in eliciting conceptual understanding (-51; p=0.000). As in case 1 (OI), pupils’ conceptual understanding also increased in case 4 (MI) (+74, p=0.000), which aligned with the increase in support in eliciting conceptual understanding (+67, p=0.000). To conclude, a relation between change in performances of pupils and a change in the support of teachers/instructors was found in all four cases. In Figure 2 we discussed total amounts of (eliciting) conceptual understanding. More information about the dynamic relationship between support and understanding can be obtained by taking a closer look at the way support and understanding change over the course of single lessons. By way of illustration, Figure 3 shows smoothed time-serial data of the level of conceptual understanding of pupils (blue line) and the level of support in eliciting conceptual understanding of teachers (black line) within the lessons. The peaks in eliciting conceptual understanding and conceptual understanding are not only caused by the amount of time the utterances took, but also by the level of openness of eliciting conceptual understanding and the level of complexity of conceptual understanding. 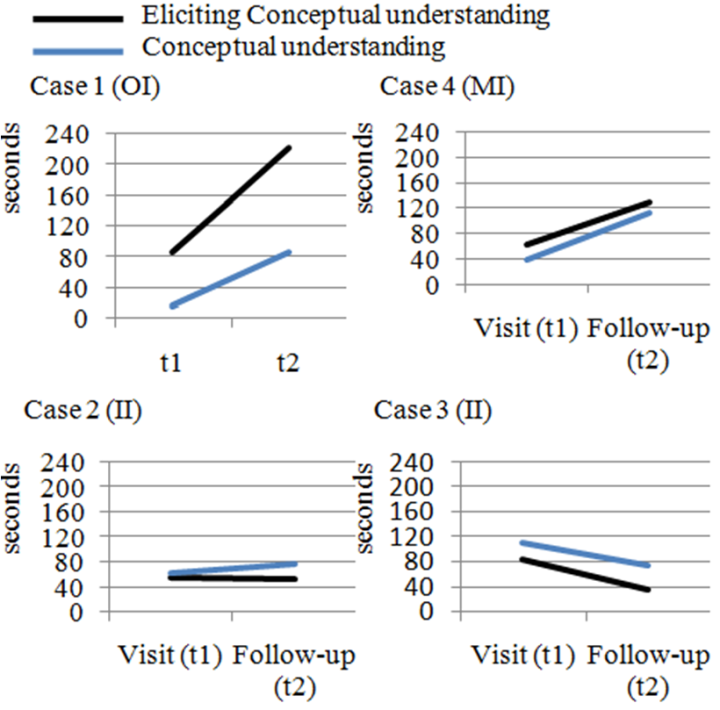 As in Figure 2, the process analyses (Figure 3) also demonstrated a positive change in cases 1 (OI) and 4 (MI)in both teacher’s support and pupil’s performances in conceptual understanding between the visit to the Mobile Planetarium and the summary follow-up lesson . In case 2, the patterns of pupils and teacher during the visit to the Mobile Planetarium (t1) were rather similar to the patterns in the summary follow-up lesson (t2). 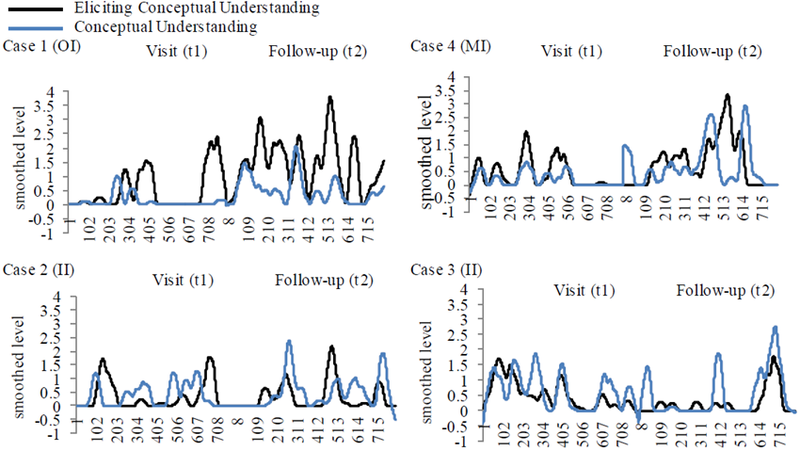 Case 3 (II) shows a relatively dense pattern of peaks in conceptual understanding during the visit, which decreased more or less in the summary follow-up lesson. Within all lessons, we see that when the teacher peaks in support (for instance in the follow-up lesson of case 1, between 118 and 328 seconds), the pupils also tend to peak in amount and level of conceptual understanding (between 328 and 391 seconds). On the other hand, pupils’ utterances at a higher level might also elicit more support from the teacher (e.g., in the follow-up lesson of case 4, between 412 and 571 seconds). In other words, it is quite probable that teachers and pupils co-constructed conceptual understanding in real-time. However, this process was not optimal at every moment within a lesson. In the summary follow-up lesson of case 1, we see that it required a lot of effort for the teacher to support the pupils to show conceptual understanding, which eventually resulted in higher conceptual understanding of the pupils (between 88 and 386 seconds). In case 2 (II) and 3 (II), the pupils seem to peak in conceptual understanding regardless of the support (e.g., in the follow-up lesson of case 3, pupils peak between 350 and 442 seconds). To conclude, on a macro level, it can be confirmed that conceptual understanding and eliciting conceptual understanding are related as we had hypothesized, but at the micro level, the co-constructing process differed per case and per moment in time. We hypothesized that trained teachers/instructors apply an open teaching style focused on the support more often than untrained teachers/instructors (hypothesis 2a), and that pupils show a higher amount of conceptual understanding in the presence of a trained teacher or instructor (hypothesis 2b). 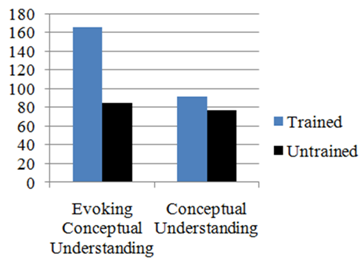 Figure 4 shows the difference in amount of teachers’/instructors’ utterances eliciting conceptual understanding between untrained teachers and trained teachers (left) and the difference in amount of utterances of conceptual understanding between pupils in a class with an untrained teacher and in a class with a trained teacher (right). The difference in the teacher’s support of conceptual understanding is significant; trained teachers/instructors supported conceptual understanding 80 times more often than untrained teachers (p=0.000). However, pupils did not demonstrate more conceptual understanding in trained settings than in untrained settings (+14), contrary to what we expected; the probability that the difference is due to chance is p=0.127. The differences were only consistent with hypothesis 2a, and not with hypothesis 2b, although we know from the support of hypothesis 1 that over time pupils’ conceptual understanding and teachers’ support in eliciting conceptual understanding was related. To test the third hypothesis, “The learning effect in terms of pupils’ performances is related to the program implementation”, we applied the effect table (Figure 1 in the Method section) to the data measured in the out-of-school visit (t1) and the summary follow-up lesson (t2). Figure 5 displays the results of the effect on the learning outcomes. The positive effect of the program is most salient in case 1 (OI). Although the pupils in case 4 (MI) received no preparation and no qualified teachers in terms of training in eliciting conceptual understanding, the learning outcomes of the pupils were also positive, especially compared with the cases 2 (II) and 3 (II), which both showed intermediary results. 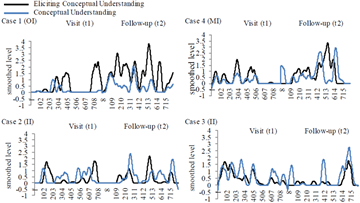 The effect of the program was related to the program implementation, as we expected; however, the effect was not proportional, as the effect of case 4 (MI) exceeded the effect of cases 2 (II) and 3 (II). In this study we wanted to know how different forms of implementation of a connected in-school and out-of-school science program affect pupils’ cognitive science skills (conceptual understanding and declarative knowledge) in relation to teachers’/instructors’ support. First, we found that a change in the pupils’ conceptual understanding was related to a change in the support given by the teachers/instructors, which supported our first hypothesis. This pattern was salient in all cases. When inspecting the data within the lessons, we observed a process of co-construction within the lessons. This process of mutual co-construction fluctuated over time, and was not always optimal during the course of the lesson, and it also differed per case. Second, we found that teachers and instructors, who were trained in applying an open teaching style focused on conceptual understanding, revealed more utterances of eliciting conceptual understanding within a lesson, which supported hypothesis 2a, although pupils assigned to those teachers did not show a significant increase in conceptual understanding (hypothesis 2b). Third, the case with the optimal form of implementation (case 1) showed the highest increase in conceptual understanding., Participants of the intermediary implemented programs (cases 2 and 3) showed semi-optimal and marginal learning outcomes. The case with the marginally implemented program (case 4) exceeded the effects of the intermediary implemented program. Our third hypothesis that the effect of the program was related to its implementation is confirmed; however, the effect is not proportional to the implementation. The results of this study confirm that the quality of the program and its implementation is relevant: the optimal program implementation is more favorable than the marginal program implementation; however, it is still a matter of discussion whether an intermediary program implementation is better than a marginal program implementation. 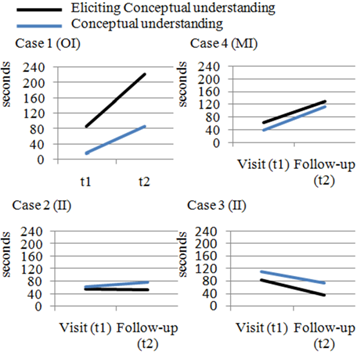 It is possible that the lack of increase in conceptual understanding in intermediary implemented programs was because the trained instructors in the out-of-school activity were more capable of eliciting the conceptual understanding than the regular, untrained teachers in the summary follow-up lessons. The relatively good performances of the pupils in the case with the marginally implemented variant of the program might be explained by the fact that, according to the teacher, this class is in a high performing school, and has high achieving pupils. Perhaps they might have performed even better if the quality of support had been higher. Considering that the case with optimal program implementation was characterized as the case with the youngest age group, with various levels of achievements of a lower performing school than case 2 and 4, the learning effect in terms of increase in amount of conceptual understanding (relative to the amount of declarative knowledge) is considerable, compared with the other cases. Based on the results, we advocate that the quality of the professional development of the teacher plays an important role in conducting out-of-school activities (). We used naturalistic, ecologically relevant conditions, which meant that we were obliged to accept the cases that signed up for a Mobile Planetarium visit. Also, we were obliged to accept the conditions of the cases. For example, in case 4, a substitute showed up unexpectedly instead of the regular class teacher. In the observations we saw that the substitute used the questions in the manual frequently, in contrast with the other regular class teachers who did not consult the manual very much. This might have influenced the results. In addition, in case 3, the teacher was not supposed to carry out the preparation lesson so as to provide a fourth variant of the program implementation, but in fact, she did carry out that specific lesson. Although the instructions for the teachers were clear, apparently not all teachers read the instructions carefully. Another example of an ecologically relevant condition appeared in cases 2 and 4, where the pupils participated in a school project on astronomy, which actually interfered with the research because the students in case 4 were meant to be unprepared for the visit, but might have learned from the school project, and therefore exhibited this knowledge during the program. These unexpected situations resulted in not being able to optimally distinguish between cases. However, this study describes the authentic, real-time processes. The naturalistic, ecologically relevant context of investigating connected in-school and out-of-school programs makes it difficult to study effects with large samples (a large number of schools) using randomized control trials. For this reason, a better and more feasible way of understanding the relation between teacher support and pupils’ conceptual understanding is to focus on the micro development of support and understanding in single lessons, in characteristic cases. This study contributes to existing research on microgenetic measurements over time, corresponding with an in-depth analysis of the process of change in naturalistic, ecologically relevant conditions. Using time-serial data, we were able to demonstrate how processes of teaching and learning developed across the short-term timescale (constructing understanding), which provides a better insight into how short-term processes may affect the long term development . In this case, pupils’ performances and teacher’s support regarding conceptual understanding during the visit to the Mobile Planetarium influenced the performances and support in the summary follow-up lesson, and the real-time interaction in the follow-up lesson was most likely influenced by the long-term effect of the visit. How exactly this relationship unfolds over the short-term timescale of a real lesson and the long-term timescale of successive lessons is a matter of future research. The practical implications of this study are threefold. First, training in applying an open teaching style focused on eliciting conceptual understanding is worthwhile, especially when the training is related to the implementation of the out-of-school visit into the curriculum. One of the premises of the training, mentioned in this study, was that the ability to adapt to pupils’ level of thinking and the support offered to pupils in developing the thinking process would lead to a higher, more complex, level of reasoning. For instance, although the teacher in the summary follow-up lesson of case 1 was constantly probing the pupils to express conceptual understanding, still the pupils struggled to perform at a high level of complexity. It is possible that without the support of the teacher, the pupils would have shown high performance levels even less frequently, and generally performed at a lower level. Consequently, it is advisable to train all classroom teachers participating in a connected in-school and out-of-school program with a coaching program, such as Curious Minds . This video-feedback coaching program focuses on eliciting and developing unexplored potential talents of pupils in science by teaching teachers to see these talents, and to offer techniques to develop them. Second, in this study we used a short version of the Curious Minds program without the video feedback coaching. We know from other research that a brief training might only show short-term effects (see, e.g., ). As the instructors and external teachers had been trained nine months before this program started, the training effect in this study could have declined. However, a strong and perhaps lasting element of the training was that the instructors were confronted with results of the effectiveness of the performances of instructors of the Mobile Planetarium, which could explain the significantly higher amount of support in eliciting conceptual understanding compared with untrained teachers. Leach and Conto  also illustrate that it is essential for professional development to receive performance feedback. This suggests that it would be advisable to include performance feedback in a short training focused on applying an open teaching style. Third, for teachers it is important that the training is aligned to the ongoing activities in the preparation, during and after the visit. We know from other research that although preparation and implementation of out-of-school activities into the curriculum is highly recommendable (e.g., ), in practice teachers often fail to do so [6, 8, 9, 10, 11, 12]. A training in open teaching connected to an in-school and out-of-school science program undoubtedly enhances teachers’ preparation and implementation into the school curriculum. Rickinson, M., Dillon, J., Teamey, K., Morris, M., Choi, M.Y., Sanders, D. and Benefield, P., A review of research on outdoor learning, Preston Montford, Shropshire, UK, 2004. Tenenbaum, H. R., Rappolt-Schlichtmann, G. and Vogel Zanger, V., “Children’s learning about water in a museum and in the classroom,” Early Childhood Research Quarterly, vol. 19, no. 1, pp. 40-58, 2004. Knapp, D., “A longitudinal analysis of an out-of-school science experience,” School Science and Mathematics, vol. 107, no. 2, pp. 44-51, 2007. Griffin, J., “Research on students and museums: looking more closely at the students in school groups,” Science Education, vol. 88, no. S1, pp. S59-S70, 2004. Braun, M. and Reiss, M., “Towards a more authentic science curriculum: the contribution of out‐of‐school learning,” International Journal of Science Education, vol. 28, no. 12, pp. 1373-1388, 2006. Behrendt, M. and Franklin, T., “A review of research on school field trips and their value in education,”International Journal of Environmental and Science Education, vol. 9, no. 3, pp. 235-245, 2014. Salmi, H., “Evidence of bridging the gap between formal education and informal learning through teacher education,” Reflecting Eduction, vol. 8, no. 2, pp. 45-61, 2012. DeWitt, J. and Osborne, J., “Supporting teachers on science‐focused school trips: towards an integrated framework of theory and practice,” International Journal of Science Education, vol. 29, no. 6, pp. 685-710, 2007. Bitgood, S., “School field trips: an overview,” Visitor Behavior, vol. 4, no. 2, pp. 3-6, 1989. Griffin, J. M.,School-museum integrated learning experiences in science: a learning journey, PhD thesis, University of Technology, Sydney, Australia, 1998. Leary, R. F., “Field trip tips,” Science and Children, vol. 34, no. 1, pp. 27-29, 1996. Rennie, L.J. and McClafferty, T. P., “Using visits to interactive science and technology centers, museums, aquaria, and zoos to promote learning in science,” Journal of Science Teacher Education, vol. 6, no. 4, pp. 175-185, 1995. Flynn, E., Pine, K. and Lewis, C., “Using the microgenetic method to investigate cognitive development: an introduction,” Infant Child Development, vol. 16, no. 1, pp. 1-6, 2007. Siegler, R. S. and Svetina, M., “A microgenetic/cross-sectional study of matrix completion: comparing short-term and long-term change,” Child Development, vol. 73, no. 3, pp. 793-809, 2002. Tal, R., Bamberger, Y. and Morag, O., “Guided school visits to natural history museums in Israel: teachers’ roles,” Science Education, vol. 89, no. 6, pp. 920-935, 2005. Cox-Petersen A. M. and Pfaffinger, J. A., “Teacher preparation and teacher-student interactions at a discovery center of natural history,” Journal of Elementary Science Education, vol. 10, no. 2, pp. 20-35, 1998. Durlak J. A. and DuPre, E. P., “Implementation matters: a review of research on the influence of implementation on program outcomes and the factors affecting implementation.,” American Journal of Community Psychology, vol. 41, no. 3-4, pp. 327-50, 2008. Gutwill, J.P. and Allen, S., “Deepening students’ scientific inquiry skills during a science museum field trip,” Journal of Learning Science, vol. 21, no. 1, pp. 130-181, 2012. Scardamalia, M. and Bereiter, C., “Knowledge building: theory, pedagogy, and technology,” in The Cambridge Handbook of the Learning Sciences, K. Sawyer, Ed., pp. 97-118, Cambridge University Press, New York, NY, USA, 2006. Krathwohl, D. R. “A revision of Bloom ’s taxonomy: an overview,” Theory into Practice, vol. 41, no.4. pp. 212-218, 2002. Chi, M. T. H. andOhlsson, S., “Complex declarative learning,” in Cambridge Handbook of Thinking and Reasoning, K. J. Holyoak and R. G. Morrison, Eds., pp. 371-399, Cambridge University Press, New York, NY, USA, 2005. Ohlsson, S., Moher, T.G. and Johnson, A., “Deep learning in virtual reality: how to teach children that the earth is round,” in Proceedings of the Twenty-Second Annual Conference of the Cognitive Science Society, L. R. Gleitman and A. K. Joshi, Eds., pp. 364-368, Erlbaum, Mahwah, NJ, USA, 2000. Schauble, L., Leinhardt, G. and Martin, L., “A framework for organizing a cumulative research agenda in informal learning contexts,” The Journal of Museum Education, vol. 22, no. 2-3, pp. 3-8, 1997. Fischer, K. W. and Bidell, T. R., “Dynamic development of action and thought and emotion,” in Theoretical Models of Human Development. Handbook of Child Psychology, R. M. Lerner and W. Damon, Eds., vol. 1, pp. 313-399, John Wiley & Sons, Hoboken, NJ, USA, 6th edition, 2006. Rappolt-Schlichtmann, G., Tenenbaum, H. R., Koepke, M. F. and Fischer, K. W., “Transient and robust knowledge: contextual support and the dynamics of children's reasoning about density,” Mind, Brain, and Education, vol. 1, no. 2, pp. 98-108, 2007. Schwartz, M. and Fischer, K. W., “Buildig general knowledge and skill: cognition and microdevelopment in science learning.,” in Cognitive Developmental Change: Theories, Models, and Measurement, A. Demetriou and A. Raftopoulos, Eds., pp. 157-185, Cambridge University Press, Cambridge, UK, 2004. Meindertsma, H. B., Van Dijk, M. W. G, Steenbeek, H. W. and Van Geert, P. L. C., “Assessment of preschooler’s scientific reasoning in adult–child interactions: what is the optimal context?,” Research in Science Education, vol. 44, no. 2, pp. 215-237, 2014. Van der Steen, S., Steenbeek, H., Wielinski, J. and Van Geert, P., “A comparison between young students with and without special needs on their understanding of scientific concepts,” Education Research International, vol. 2012, pp. 1-12, 2012. Meindertsma, H. B., Predictions and explanations: short-term processes of scientific understanding in young children, PhD theses, University of Groningen, The Netherlands, 2014. Smith, L. B. and Thelen, E., “Development as a dynamic system,” Trends Cognitive Sciences, vol. 7, no. 8, pp. 343-348, 2003. Alfieri, L., Brooks, P. J., Aldrich, N. J. and Tenenbaum, H. R., “Does discovery-based instruction enhance learning?,” Journal of Educational Psychology, vol. 103, no. 1, pp. 1-18, 2011. Krajcik, J. S. and Blumenfeld, P., “Project-based learning,” in The Cambridge Handbook of the Learning Sciences, R. K. Sawyer, , pp. 317-334, Ed. Cambridge University Press, New York, NY, USA, 2005. Roth, W. M., “Teacher questioning in an open-inquiry learning environment: interactions of context, content, and student responses,” Journal of Research in Science Teaching, vol. 33, no. 7, pp. 709-736, 1996. Van Zee, E. and Minstrell, J., “Using Questioning to Guide Student Thinking,” The Journal of the Learning Sciences, vol. 6, no. 2, pp. 227-269, 1997. Chin, C., “Classroom interaction in science: teacher questioning and feedback to students’ responses,” Internationa Journal of Science Education, vol. 28, no. 11, pp. 1315-1346, 2006. Van Zee, E. H., “Should professional development include analyzing and coaching ways of speaking during inquiry-based science instruction in elementary classrooms?,” Cultural Studies of Science Education, vol. 4, no. 4, pp. 847-854, 2009. Shulman, L. S., “Those who understand: knowledge growth in teaching,” Educational Researcher, vol. 15, no. 2, pp. 4-14, 1986. Rowe, M. B., “Wait-time and rewards as instructional variables, their influence on language, logic, and fate control: part one-wait-time,” Journal of Research in Science Teaching, vol. 11, no. 4, pp. 81-94, 1974. Wetzels, A. F. M., Curious Minds in the Classroom: The Influence of Video Feedback Coaching for Teachers in Science and Technology Lessons, PhD theses, University of Groningen, The Netherlands, 2015. Dunbar, K. N. and Fugelsang, J., “Scientific thinking and reasoning,” in Cambridge Handbook of Thinking and Reasoning, K. J. Holyoak and R. G. Morrison, Eds., pp. 705-725, Cambridge University Press, New York, NY, USA, 2005. Azmitia, M. and Crowley, K., “The rhythms of scientific thinking: a study of collaboration in an earthquake microworld,” in Designing for Science: Implications From Everyday, Classroom, and Professional Settings, K. Crowley, C. D. Schunn, and T. Okada, Eds., pp. 51-82, Lawrence Erlbaum, Mahwah, NJ, USA, 2001. Candela, A., “Earthly Talk,” Human Development, vol. 44, no. 2–3, pp. 119-125, 2001. Van der Sijde, P. C., “The effect of a brief teacher training on student achievement,” Teaching and Teacher Education, vol. 5, no. 4, pp. 303-314, 1989. Bos, J. and Steenbeek, H., Mediacoder, A Simple Application For Coding Behavior within Media Files. University of Groningen, Groningen, The Netherlands, 2010. Good, P. I., Resampling Methods: A Practical Guide to Data Analysis, Birkhäuser, Boston, MA, USA, 2001. Hood, G. M.,PopTools, Pest Animal Control Co-operative Research Center (CSIRO), Canbarra, Australia, 2010. Simonoff, J. S., Smoothing Methods in Statistics, Springer Science & Business Media, New York, NY, USA, 1996. Harkins, H. K.,Influences on practice: a study of teachers who implemented curriculum-based field trips with classroom connections, PhD Theses, paper 74, University of Connecticut, 2013. Steenbeek, H., Jansen, L. and Van Geert, P., “Scaffolding dynamics and the emergence of problematic learning trajectories,” Learning and Individual Differences, vol. 22, no. 1, pp. 64-75, 2012. Leach, D. J. and Conto, H., “The additional effects of process and outcome feedback following brief in‐service teacher training,” Educational Psychology, vol. 19, no. 4, pp. 441-462, 1999.